We have talked about the details of our uncontested divorce process in other pages on this site. But it’s worth taking a little time to explain in detail why our process and our general approach to divorce are so different than what you’ll find in a traditional courtroom divorce or even other mediation options. At Split Simple, we believe in a rigorous, data-driven, transparent process. Our system is based on years worth of evidence of what works and what doesn’t, and we have crafted our process to meet the unique needs of our clients. If you think an uncontested, mediated divorce might be the solution for you and your spouse, please call Split Simple today at (855) 665-9920 or contact us online. In a traditional courtroom divorce, both parties are (usually) represented by an attorney. Lawyers are ethically bound to vigorously represent the interests of their clients- doing otherwise is a violation of their ethical code. By contrast, a mediator is tasked not with representing one party, but instead with finding a solution that fairly meets the needs of both parties. It’s a significant difference. 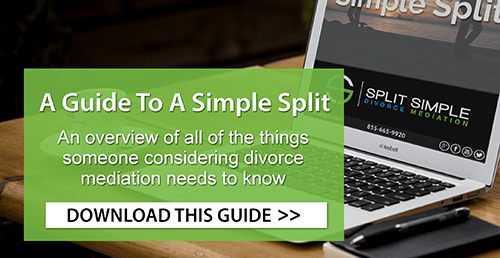 At Split Simple, our attorney-mediators work to reconcile the seemingly irreconcilable disagreements between you and your spouse. But unlike other mediation services, our attorney-mediators are also trained as lawyers. We have experience in family law and in courtrooms. That experience has led us to the conclusion that the traditional divorce process fails many clients. But it also means we understand all relevant divorce laws in your area and know how to forge a settlement that will earn a judge’s approval. Our process is simpler, smarter and proven effective. We’re convinced it can help just about any couple trying to reach an equitable divorce settlement, no matter how intractable the problems might seem. If you want to speak with Split Simple about arranging a consultation to discuss your Denver or Chicago divorce mediation, please call us today at (855) 665-9920 or contact us online.